The 1S5 is a diode pentode with the diode being used as an IF signal detector and the pentode as an audio amplifier. To obtain a reasonable amount of gain the anode resistor is high in value so the following stage control grid resistor, typically 3.3Meg will have an effect on the gain. As shown the voltage gain was x75 and the upper -3dB point was 10KHz. Coupling capacitors should be chosen for the required -3dB low frequency cut-off point, typically 300Hz for communications applications. The 3S4 is a pentode power amplifier which may also be used with reasonable results as an HF amplifier. 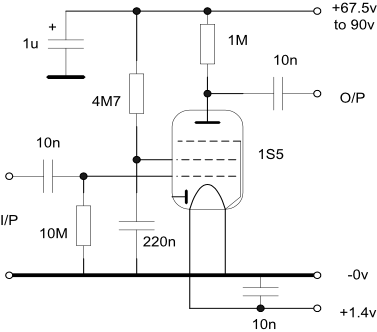 The circuit shown is of an AF amplifier with a typical output power of 270mW with 10% distortion on a 90v DC supply. Important - please note that some power output valves may require a negative bias on the control grid or a very high value grid resistor which is not shown in the circuit to the right. Check your chosen valve data sheet for its precise requirements.